A good, well-built fence can contain your kids and pets, provide privacy, and improve the appearance the appearance of your home. If installed property, a good fence also can increase the resale value of your home substantially. However, many homeowners are overwhelmed by the types of fences available. Below is a summary of some considerations to keep in mind when determining the type of fence that will best fit your needs. The first step when you want to build a fence is determine what purpose you want the fence to serve and if it is suitable for the property. Fences serve four primary purposes: privacy; security; decoration, and containment. Privacy fences are best when you primarily want to preserve your privacy and are not concerned about obscuring your view of your surroundings. Security fences help you to keep intruders away and are generally more than six feet tall. Security fences can be decorative but have features that make it difficult for intruders to scale the fence, such as spikes at the top or a smooth outer face. Decorative fences, such as some picket fences, are primarily for appearances and do not provide much privacy. They do provide some containment and do not obscure the view of the surrounding area. Finally, containment fences keep kids and pets confined to a certain area or help to prevent people from entering potentially dangerous portions of the property, such as a swimming pool. Both chain link and picket fences are good for containment, with picket fences being more decorative. Certain fencing materials, such as wood or brick, cost significantly more than other materials. The least expensive option are usually chain link or wire fences. However, these options may not increase the resale value of your home as much as the more expensive fencing materials, such as vinyl. More expensive fencing materials not only will enhance the value of your home but are generally have less maintenance costs. A high-quality vinyl fence is virtually maintenance-free and requires no painting. 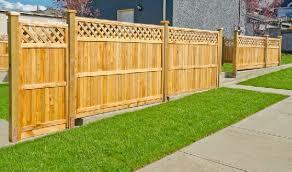 Vinyl fences also have a look very similar to wood. A less expensive fence made of natural wood requires yearly maintenance, including painting and staining, Ornate iron and aluminum fences also are among the more expensive fencing materials, but like vinyl, require very little maintenance to keep them looking good. Once you have an idea of what kind of fence you want, it is critical that you take care in choosing the best contractor for your job. Installing a fence is best left to professionals, so you should do call around to find a reputable fence contractor. It pays not to skimp on choosing the right contractor since a poorly done fencing job can actually detract from your home’s appearance and value. Make sure you get references from satisfied customers of the contractor and get estimates from at least three fence contractors. Do not hire any contractor who insists on being paid in cash or refuses to provide a written estimate before beginning work on your property.